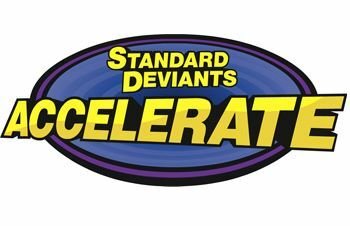 Standard Deviants Accelerate is an online learning system for core subjects for junior and senior high students. Each class has varying grades recommended. The youngest being for the Arithmetic course beginning at Grade 3, and the AP Courses beginning at Grade 11. Something for every age in between. We utilized it for 7th and 10th grade. 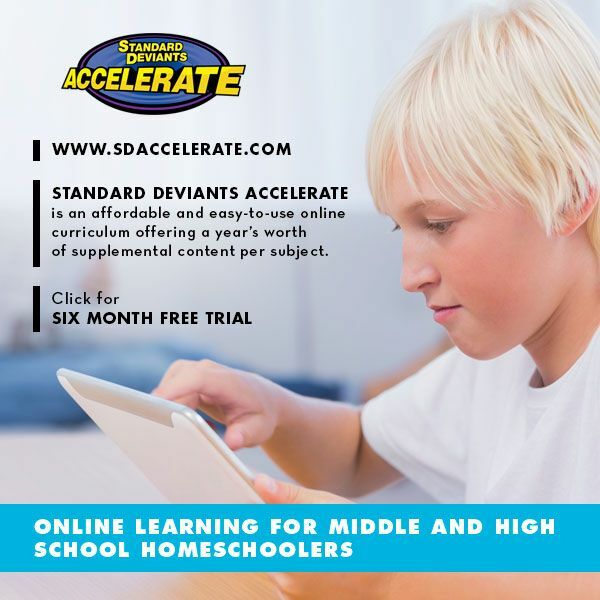 We were given Standard Deviants Accelerate Homeschool Courses with access to all of these courses for an entire year! A huge blessing to us to help aid in our review process. 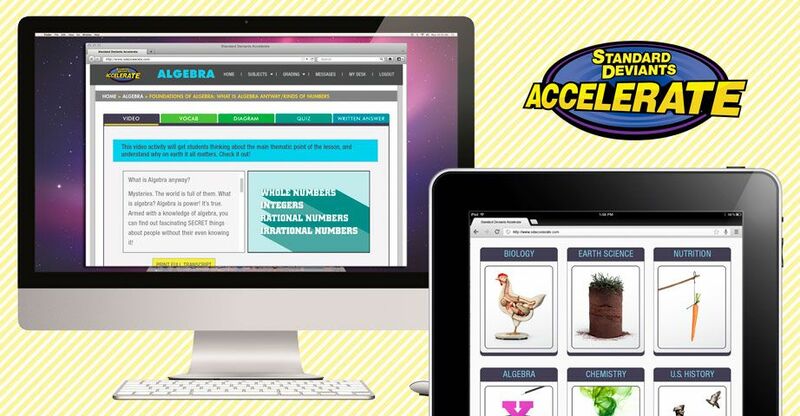 Homeschoolers can purchase the course for use by one student for $99 for a year, or $24.95 per month. This is for the regular courses. AP courses are available for one student for $14.95 per month. You can click on each icon on the page for Homeschool Courses and get a course description and what the topics will include. I decided to try this with 2 of my students to gauge how well it worked for both a Junior High and High School Student. We tried Earth Science with my 7th grader. He has his own log in information and it keeps track of his progress and class that he can log into. Each student will need his/her own email address for access. I just used one of mine and assigned a different one of my personal ones for each student. They aren't typically online for using email and this worked out best for our family. This would be a very easy system to run a couple courses at one time for your student. I do wish there was a way to have an arrow pointing to where we are in the list of videos. My memory isn't that great and I sometimes have to click on previous ones to see if we had already watched that video. Even highlighting the ones we have already watched would be helpful. 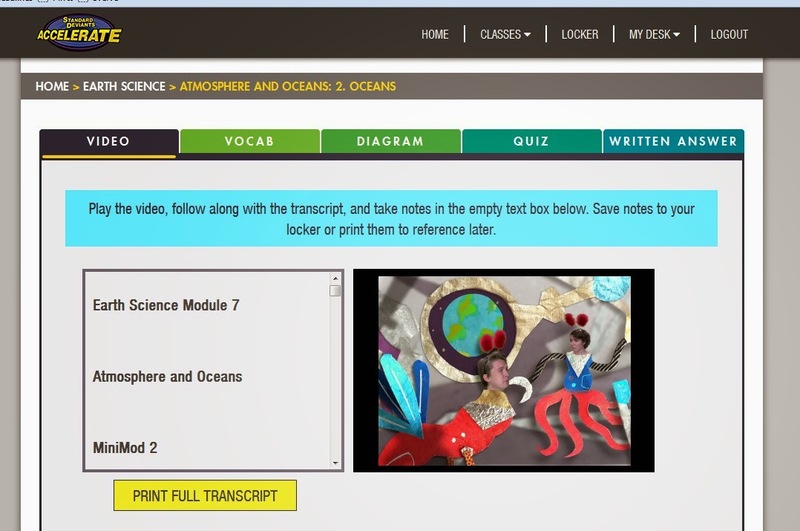 Each lesson includes a video, vocabulary words, diagram, quiz and written answer. You have the option of printing out a transcript of the video as well as the the other areas. This works nicely if you don't want to spend less time online and improve some writing skills. The videos are very engaging! They definitely seek to entertain and educate the student. They use a variety of multi media to keep their attention, and to visually help the student remember the facts that are being taught. They include joking around and humor that is geared toward that age group as well. I thought the videos were very well done and were great for keeping us watching. Definitely not your boring science style video! I was forewarned that the Earth Science course did include some evolutionary style teaching. I let my son know before we began and we were ok with that in small portions. Earth Science begins with the beginning of time, and there was mention of the Big Bang Theory on several occasions. I personally would have liked to see some additional theories stated for sake of Science.Once we got through the first 2 modules we didn't run into the evolutionary input as much. My 10th grader really struggles with writing, and has much of his schooling days. As he gets older I am finding it critical to find a program that really works for him. We tried English Composition, being he is more of a visual learner than listener. I set him free to work on the program and he came up short. We are restarting it with Mom near by to drill the key facts that are being taught. I see it as a good program that if he can grasp it, will really give him a core for learning to write basic papers. He however is not motivated to pursue it on his own and will need the constant reinforcement of my help. I think that is a good thing to find out with this program. As my 7th grader could easily become engaged and be successful, my 10th grader is just not able to with this specific program. Can we still utilize it? Yes for sure, and I am looking forward to his skills increasing by using the Standard Deviants Accelerate English Composition, and maybe we will even be able to move on to AP next year! What courses are you interested in? Check out and see if any of the review crew tried out those courses. Learn more by clicking on the link below.